By Saoirse Nisbett | February 27, 2018. 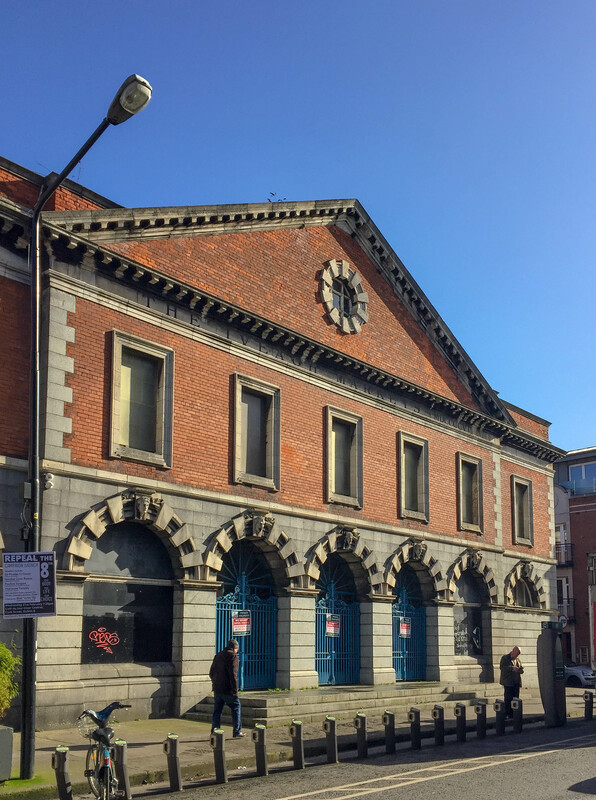 The Iveagh Markets property located on Francis Street in the Liberties has seen better days. The once thriving hub of trade and community is now standing on its last legs. The Iveagh Markets have been empty on account of its closure in the 1990s. Ever since the bustling market shut its gates, the building has been decaying away without any sign of upkeep. Hotelier, publican and property developer, Martin Keane has held ownership of the property for nearly 20 years now and has yet to make any headway in its development. It is said this delay is due to Keane’s failure to raise the necessary €90 million needed to fund his plan for a complex composed of the late Victorian market itself along with the former live music venue, Mother Redcaps, to transform it into a hotel and restaurant. Keane, who also owns Oliver St John Gogarty and Blooms Hotel, filed for, and was granted, planning permission for the Francis Street property back in 2007 and then applied for a five year renewal of the contract in 2012 which has since expired in August of last year. All that time the building’s safety status was going from dangerous to critical. The building has sustained serious water damage resulting in the corrosion of the iron frame holding it up, plant life has taken over the building and there is visible deterioration on the surface of the building’s exterior suggesting the water is permeating throughout the structure. Since then, Dublin City Council had given Keane until the 31st of January 2018 to give up possession and in failing to do so, threatened to change the locks on the Victorian building. Keane, on the same day, sent “legal correspondence” in the from of a solicitor’s letter and a “without prejudice letter” regarding the ownership issues but none of the local councillors have been privy to the contents of the letters and the Dublin City Council say the letter is “currently with our legal advisers for review”. Keane has maintained that because he has done certain works on the building thus far that development entitlement should stay with him. MacVeigh said the work Keane has seemingly done is purely “archaeological excavation … which doesn’t constitute developing”. From the time used trying to prove entitlement, Keane is putting the markets further at risk of reaching a state of ultimate disrepair. The council has appealed to Keane’s goodwill and has given him multiple opportunities to hand over ownership, thus avoiding court battle. MacVeigh believes if Keane was planning on giving the Markets back, he would have already done so. MacVeigh has been heavily involved in a campaign to develop the Iveagh Markets called Reclaim the Iveagh Markets. The campaign includes locals and other councillors that are passionate and ready for development. They are currently waiting for a response from the council and court to determine their next step. “Who knows we might put picket signs up at Keane’s bars,” joked MacVeigh. Keane was unavailable to make any comment.